Due to customer demand I am now offering diamond remote keys. The new diamond remote key is actually a product from China that I've been testing and while it's got a few issues I think it's a good enough option for some people. I will get into who this service is for below, but, first I want to say a few things about BMW keys. This service is not for people with a non-working genuine BMW diamond key. The remote electronics in this new diamond remote key do not charge in the ignition like a genuine BMW diamond shape key. The case is snap together and every 3-5 years or so you will need to open it up to replace the CR2016 battery. The CR2016 battery can be found just about everywhere batteries are sold and should cost only $2-3. The case is pretty tough to snap apart so during normal use, drops, etc. it should not accidently pop open. There is no BMW logo sticker for the center button. I am currently looking for a suitable BMW logo sticker, but, so far I haven't found one. The genuine BMW sticker is slightly too big and doesn't fit. The Chinese knock off logo stickers are crap and made to stick onto a domed surface. This case has a flat surface so it doesn't stick on. For some reason the trunk release button has about a 1 second delay which the genuine BMW remote does not have. A little annoying, but, it works. BMW uses two types of key blades HU92, 2-track or groove cut which is just has a single groove down the center of the blade and HU58, 4-track which is cut on the edges of the blade. Currently I only have new diamond remote keys for the HU92, groove cut key used by the E46 3-series, E83 X3, E85 Z4 and E53 X5 (list is not complete or fully verified). I currently do not have the HU52, 4-track key blanks used by the E38 7-series, E39 5-series, but, I have to have them in stock and tested in the next month. This is not for people who have the E65/E66/E67 7-series, E60/E61 5-series or E90/E91/E92 3-series. 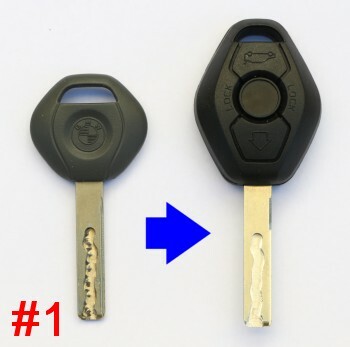 Those cars use a completely different remote system, even the E60/E61 5-series which uses a similar looking diamond key, but, the insides works completely differently. Making keys for a BMW is not as easy as the old days where you just cut the new key on a duplication machine and away you go. All modern cars have wireless transponders in them that if not present in the new key and coded properly will not start the engine. When you go on eBay and see these blank keys for sale they say you need to have a locksmith cut the key and program the transponder. It's not that easy. You can't copy the transponder and the locksmiths can't program it to start the engine. The immobilizer module in the car is programmed with a set of 10 very long random numbers, one for each of the 10 keys possible for the car. BMW corporate keeps track of what was programmed into each immobilizer module and the VIN of the car it went into. When you buy a new key from the dealer they don't make the key there, they can't. The dealers don't have the blank keys, they don't have key cutters and they don't have access to the immobilizer number database. The dealer sends the order to BMW corporate and they cut the new key and program it with the numbers for the next open key slot based on the VIN number and FedEx the key to the dealer for pickup by the customer. BMW corporate keeps track of every key that was ever made for every BMW with an immobilizer. The locksmith doesn't have access to this database and they can't read the code from the key. The immobilizer module in the car generates a psuedo random number, sends it to the key transponder chip which mashes it together with the secret number that it was programmed with. Part of this resulting number is then send back to the immobilizer module which verifies that the correct response was received. If the response was good it enables the starter motor and informs the fuel injection computer that the key was good. #1 This is for people who have a valet key or plastic wallet key and want to turn it into a diamond remote key. Send in your genuine BMW groove cut valet key or plastic wallet key and I will duplicate the cut into the new diamond remote key so it works in the locks. I will transfer the engine immobilizer transponder from the genuine key so the new key will be able to start the engine. 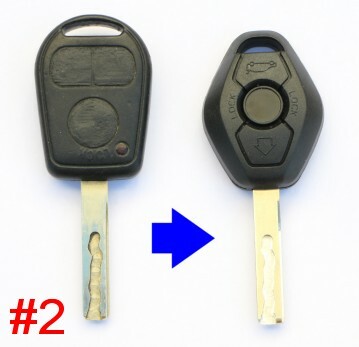 #2 This is for people who have a old worn out rubber button key that maybe doesn't work anymore and wants to replace it with the more modern diamond remote key. Send in your genuine BMW groove cut rubber button key and I will cut the new key from your old one and move the immobilizer transponder to the new key. You will have a new key that works in all the locks, starts the engine and has remote keyless. The old key will no longer be able to start the engine. Both services are $60 which includes the new diamond remote key, key cutting, transfer of the immobilizer transponder and return shipping within the US. International shipping $5 extra. First I get in touch with me. I want to know what car you have (model & year), what key you are going to send in (valet, plastic, rubber button key) and what is the cut on the key (groove cut or 4-track, outside cut). Contact me by phone at 310-283-4273 or email me at scott@bmwgm5.com After I determine that everything is okay, I'll give you my address.